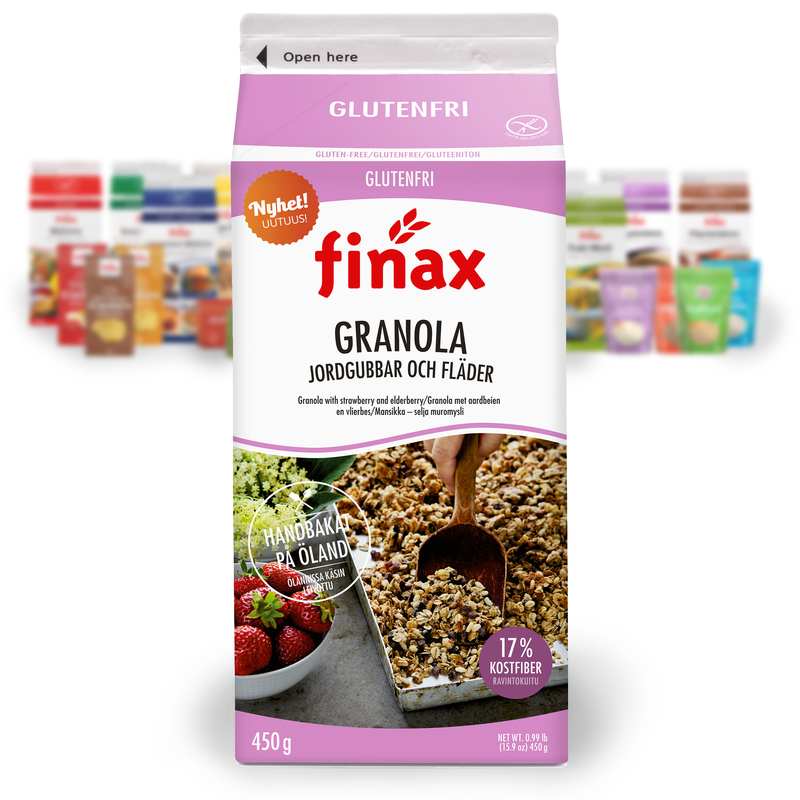 Oat flakes (gluten-free), dextrin (maize), rapeseed oil, rice crisp [rice, maltodextrin (maize), rice starch, salt], roasted buckwheat flakes, sugar, strawberry pieces 6% [concentrated apple puree, concentrated apple juice, strawberry puree, citrus, fibre, gelling agent (pectin), colouring agent (concentrate of chokeberry elderberry, apple), natural strawberry favouring], multigrain flakes (rice, maize, bran, sugar, inulin, fructose, salt), rice flour, salt, flavouring. Our Granola is unique. We bake it ourselves, by hand in our own bakery on an island outside the Swedish East coast. Our granola with strawberries and elderberries is a completely new flavor combination. It is a baked, crunchy and crispy granola with gluten-free oat flakes, rice crisp, roasted buckwheatflakes and multigrain flakes. It has a rich flavor and balanced sweetness from the strawberries and elderberries. It also contains a lot of fiber, a full 17 %.